Social media has definitely changed our worldview in the last 10 years. It has been a real phenomenon that has involved almost all online players, from individuals, companies, governments and even criminals. As to what it did to us personally, I’ve written about social media changing us in this previous post. We can compare it, to some extent, with the internet boom happening in the 1990s, where companies and individuals started rushing online when realizing the benefits that online communications would bring to their businesses or individual activities. In this context, social media might appear as an improved subsequent phase of the internet development which resulted in the “dot-com bubble” in the late 1990s (this is not to say we will have a social media bubble in the next years).Anyway, social media has evolved a lot in recent years, and to some extent, it’s clearly drafting the future of the overall internet. Streaming live video: As posting videos is much more readily available and people become aware that its impact can be much bigger, usual texting is easily converging into video streaming. By the way, think about law enforcement regarding driving and texting, while there is no restriction to streaming while driving. Therefore, Facebook (Live), Periscope, YouTube, and LinkedIn already offer such functionalities, and it seems that, in the near future, it will be adopted by more and more social platforms. Moreover, social media platforms that only work with live streams such as Snapchat, Vine or Beam are gaining huge momentum and various professional services (i.e. Ustream, Livestream) offer functionalities that you can use and integrate within different platforms. Virtual reality (VR): Some people say that in the next year we will see a switch in the way classic displays are used. It could happen that you enter in an office of a multinational and find people using VR glasses instead of mere monitors. VR will definitely improve the way we work and socialize by allowing us introduce human gestures when communicating. Psychology attributes more than 50% of the understanding of a message in human communication to it’s non-verbal components (such as posture, hand and eye movement, inflections, etc). Therefore, we have reasons to believe that VR will bring about more effective and more intense human communication. To further understand how VR works, have a look at this video. 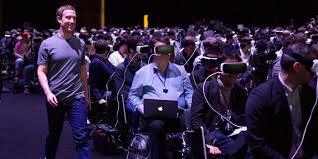 In 2014 Facebook bought an important company in the field (Oculus VR) and the results are already impressive. Artificial Intelligence (AI): As Wikipedia puts it, an “ideal intelligent machine is a flexible rational agent that perceives its environment and takes actions that maximize its chance of success at an arbitrary goal”. Not to be confused with artificial general intelligence (AGI) which is “the intelligence of a (hypothetical) machine that couldsuccessfully perform any intellectual task that a human being can” and can also involve machine consciousness. In other words, AI is giving you a hand by doing something for you, sometimes before you thought of it. You can already notice such AI functionalities like: face recognition, voice recognition and control (Siri), news feed filtering algorithms, chat bots, semantic search etc. Wearable integration: Wearables include all types of gadgets that you use daily for different types of activities, they incorporate a small computer and usually you can wear them as accessories. In this category we can find smartwatches, glasses, activity trackers and others. The trend now is to integrate as much of these gadgets with your social media accounts. You can benefit from instant communication of your activity with your online community, personalized content, whereas the social media platforms can also benefit from your activity tracker statistics for marketing purposes (gyms, healthy restaurants etc.). Telepathic communication: although in a very early stage it’s a thought that Mark Zuckerberg (Facebook CEO) has expressed openly. “One day, I believe we’ll be able to send full rich thoughts to each other directly using technology. You’ll just be able to think of something and your friends will immediately be able to experience it too, if you’d like. This would be the ultimate communication technology,” he said. Below you can find a chart presenting the 10 yr Facebook road map as presented in the F8 conference 2016. Before we consider these developments, though, we need to agree that in order to facilitate the development of such features and technologies, more speed and more bandwidth are necessary. Internet infrastructures and connectivity have become a key area of development as more and more investments are done in broadband technologies. Reaching out to as many people as possible worldwide is one of the biggest goals of social media platforms. That is why more people connected to the internet with higher speeds mean more revenue for companies. Drones, satellites, new mobile telephony technologies and standards (5G) are now getting a lot of attention as enhancers of connectivity between people around the globe. Along with the development of social media and the underlying infrastructures, there comes another big challenge for the industry. How to analyze the enormous amounts of data collected. And there comes big data, a concept that appeared around 2007, that deals with techniques for analyzing large data sets or sometimes unstructured information. Social media companies are investing a lot in those kind of technologies and in skilled people. It is certain that we will have interesting changes in the next 10 years as to what regards the development of social media, and they will probably become an even greater business tool. Just having an online connection won’t be enough, people and businesses will also have to get engaged in social media. Let’s just hope that the current free basic features will remain free. Well, indeed this is a possible scenario, although Falls’s post was published in 2008 and we are now 8 years later. Indeed, social media has become a great part of our lives. There are kids nowadays who learn using social media at a very early age. For them, social media may become as natural as breathing. Indeed, though, for some other generations, the backlash phenomenon might appear. I am thinking now of people over 35 people that were not raised in the social media milieu that they might want at some point to remember the good old days where discussions were carried out over a pint of beer or coffee and not through a midnight chat or video streaming. Nonetheless, a total backlash would be too much, I believe that generational backlashes of certain degrees seem more probable.